The charts below say just one thing about GoT’s producers: they know their audience. When a dip happens they don’t expect it to stay down, they make sure it goes up again. After a week’s break from having no GoT, fans have been rubbing their hands in anticipation for The Mountain and The Viper. 1. Insert a bunch of filler scenes. 2. Tease the audience, occasionally surprise them. 3. Finally end with an explosive plot mover. 2. Sansa Stark’s intriguing dramatic performance. 3. Finally, finally after some winding tale from Tyrion about beetles, we have the epic short fight scene between Gregor and Oberyn. Lets move on to what The Mountain and The Viper teaches us writers about audience/ reader response. #1 Finding a sweet balance between the endless teasing and the filler scenes. Bored audiences or book-first critics will keep watching, despite their complains, because they know the epic fight scene in which the episode is named for, will only appear in the last few minutes. This is especially true for crime and murder mysteries. How do you keep your audiences guessing and tense? It’s not easy finding that sweet spot, but when you get the hang of it, it becomes easier. #2 Always thwart audience/reader expectations. Sansa’s confession thwarts the duel between Gregor and Oberyn on a few levels because it rides on pure surprise, both for the bookie and the TV fan. The unveiling of her identity as Sansa Stark to the Lords of the Vale is never mentioned in the book, but on-screen, you can’t help admire her character development. Sansa’s been a caged bird all her life, mimicking the things she’s been taught, but she’s finally come into her own. My sister pointed out something interesting to me. Sansa’s introduction in season one opens with her knitting in her room in Winterfell and four seasons later, she’s also calmly knitting in her room in The Vale. The interesting parallels that can be drawn about her character here, is that in some ways, she’s still the same Sansa with the values she’s grown up, but she’s also a different one. Ruthless, hardened and practical. With a numerous cast of characters and a ton of unravelling plots, we’re forced to finally stop dismissing her and look up. When writing, do you have that particular bland character your readers never expected to shine or take on a critical role? It’s that ‘woah’ reaction that will keep them reading. #3 Do not disappoint your reader with a half-assed final scene. Go with a bang. 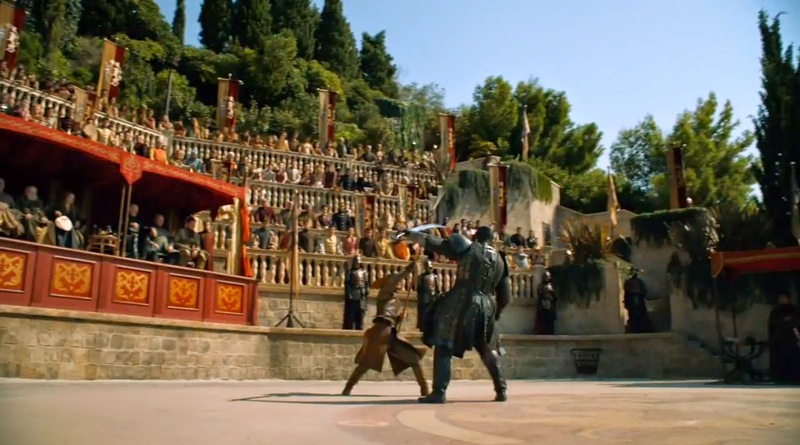 The fight between Gregor and Oberyn doesn’t last long, only a few minutes. But in that span of a few minutes, we learn more about Oberyn’s mysterious character. While its not mentioned in the TV series, his close relationship with his sister was mentioned a few times in the books. His motive and intentions become clear. In those last few minutes, Oberyn isn’t as portrayed as a whore-loving, amused and indifferent prince of Dorne. He’s simply a bereaved brother who let his emotion.